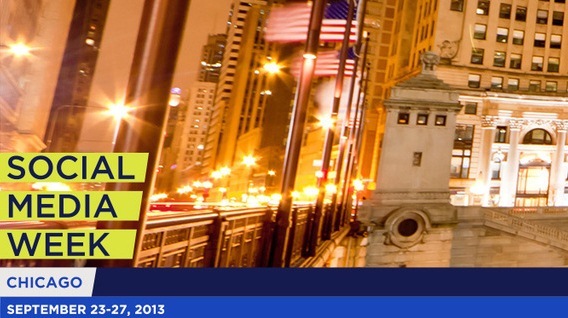 Today, registration opens for Social Media Week Chicago 2013. If you’ve never been, it’s a week-long event featuring free social media panels, discussions, tutorials and networking events. For anyone involved in marketing, social media, or just business, it’s a great opportunity to brush up on the latest and greatest in social media. You’ll see that there are events for various topic areas from marketing to education to transportation to tourism to music. Chicago has long been a mecca for the music scene, from blues legends to the birth of house music. Today, with more and more festivals taking place in Chicago and the expansion of the EDM scene, DJs continue to be driving forces in local music industry – and social media is a key tool used to promote themselves and their music. In this panel, hear from some of the city’s hottest house, electronic and hip-hop DJs on how they use social media successfully to connect with music fans, other DJs and influencers in the city’s music and entertainment industry. When: Thursday, 9/26, 4-5 p.m. The Latino community in Chicago is a vibrant one, and social media is becoming an increasingly important platform for the community’s musicians, artists, promoters and event producers. In this panel, we talk to some of the leading Latino bloggers, tastemakers and artists on how they use social media to engage the Latino community, drive event attendance and secure opportunities for their work. When: Thursday, 9/26, 1-2 p.m.
Black & Latino dominance on Twitter & Facebook, yet omission from social media strategies. This should certainly be an interesting discussion. Details here. Getting Closer to Your Community, How Google+ Can Help. Part of me just wants to visit the Google Chicago offices, but also curious to see that latest info on Google+. Details here. Improving Social Media with SEO. I’m really interested in getting more SEO savvy. Details here. “Sure, you can take a picture of that” – Enabling social media at the MCA. Love seeing the art community getting involved in SMW. Details here. MADE: World Star. Really curious to hear this discussion about the role of World Star Hip Hop in AA communities. Details here. Social Media and the Music Industry. Of course, I have to attend this one. And it will be right on the heels of the first-ever Chicago Music Summit the week prior. Details here. And the list isn’t complete without a plug for a presentation by Zócalo Group President & CEO, Paul Rand, around his upcoming book, Highly Recommended. Details here. There are a ton of other events that are definitely worth checking out, so visit the website asap and register for the ones that catch your eye. Registration does fill up fast for a lot of these. And stay up to date on the latest and greatest around #SMW13 by following @SMWChicago on Twitter.